Netanyahu mentioned the great leaders through history who have had a profound influence on the Jewish people and the state of Israel, including King Cyrus who liberated the Jews and issued an edict for the rebuilding of the Jewish temple in Jerusalem. 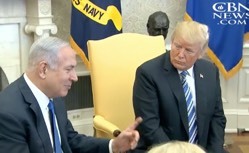 The president told reporters his staff is looking at the possibility during a bilateral meeting with Israeli Prime Minister Benjamin Netanyahu in the Oval Office today. It's his first visit to Washington since President Trump recognized Jerusalem as Israel's capital and started making plans to move the US embassy there. In his remarks, Netanyahu mentioned the great leaders through history who have had a profound influence on the Jewish people and the state of Israel, including King Cyrus who liberated the Jews and issued an edict for the rebuilding of the Jewish temple in Jerusalem. "Mister President, this will be remembered by our people throughout the ages," Netanyahu said with a smile. "If I had to say what is our greatest challenge in the Middle East, to both our countries, to our Arab partners it's encapsulated in one word: Iran." He told reporters the Islamic Republic is "practicing aggression everywhere" and that Israel and America "have to stop this country that chants 'Death to Israel' and 'Death to America'." The US is also making plans to build a new permanent embassy in Jerusalem. The president says the US also continues to work on a Middle East peace deal, adding, "Taking Jerusalem off the table gives us a real opportunity for peace."